Chinese economy and the Sino-American relations are set to become the primary theme for the markets in 2019. U.S. overheating – and more Fed tightening – is the risk that comes in second. 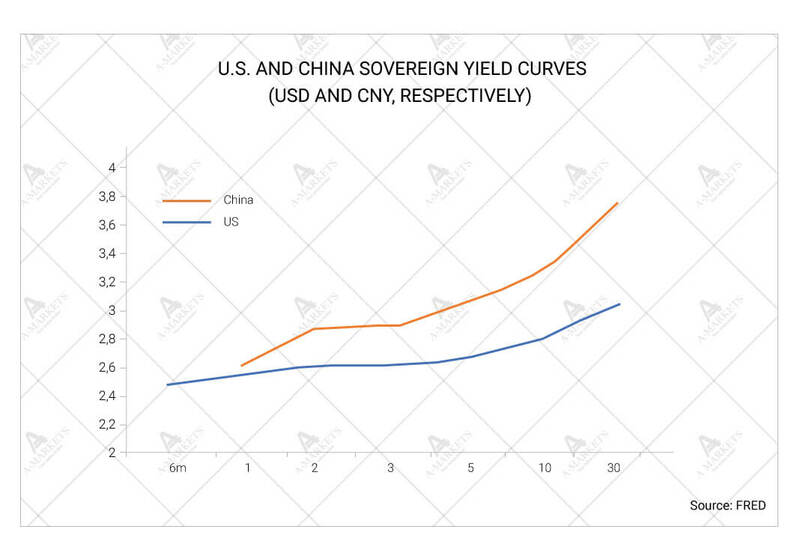 We still do not expect either a U.S. or a global recession in 2019, but the yield curves will likely invert. Trading environment will remain difficult as China is determined to allow further yuan weakness, while the twin deficits problem is once again a headwind for the dollar. 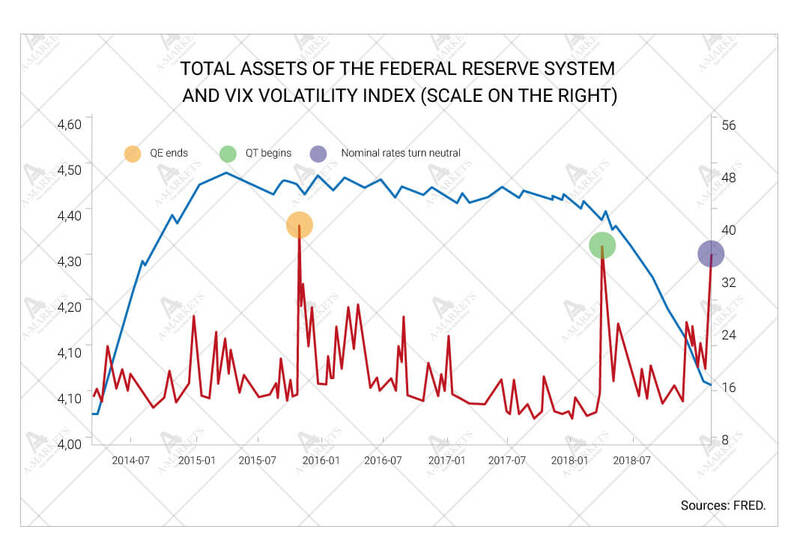 General asset volatility is forecast to stay below the end-2018 levels, with the two usual jumps expected in the spring and in the fall. As anticipated, the year of 2018 proved to be one of the worst in financial history. 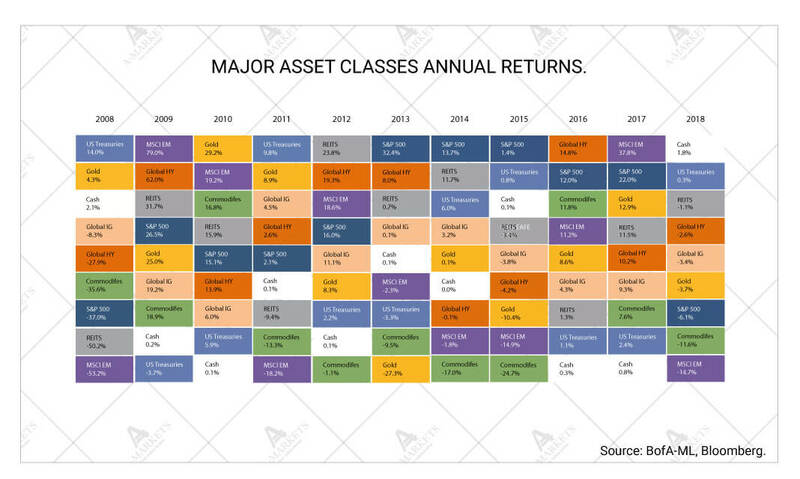 For the third time in half a century, every asset class has yielded negative total returns. Towards the end of the year, the market looked like it was in a full-blown panic mode. The sell-off affected all asset classes, prompting holders to liquidate and move their money into safe havens like the U.S. treasuries. Of note, oil prices were falling sharply for three months straight, from early October until the very end of December. Now, before we delve into the forces driving investor fear, let us remind the readers of the main reason for this turbulence: the Fed’s rate hike and balance sheet roll-off. Tighter dollar liquidity means higher volatility and less more risk-off episodes, which is, of course, bad for the markets, specifically those that used to benefit from liquidity injections. That is, in fact, the reason for the sell-off being this massive. While QE clearly inflated the bond market, stocks were also enjoying inflows and the low-rate environment. With both gone, positioning inevitably underwent major adjustments. So how far can the market plunge go? Is the recent market turmoil justified at all? The answer here, as always, depends on what central banks, primarily the Fed, do next. The recent spike in volatility suggests that the FOMC will be more cautious about marching rates higher in 2019. This is also reflected in the fact that the Fed is now prepping the market for the end of the tightening cycle. Under our baseline scenario, we now anticipate just two rate hikes in 2019, and one or two more in 2020. We’re still projecting a fairly hawkish terminal rate (70 b.p. higher than priced in by the futures market), although we now expect the Fed to shift its strategy and rhetoric. The next opportunity for that would be at the January 29-30 policy meeting. We may even be in for some headline-grabbing statements from the Fed’s key officials, including chair Jerome Powell. Traders shouldn’t expect much of an adjustment to the central bank’s rate-hike plans though. Instead, they’ll probably put out something about slowing down the QE unwind, which would spark a massive surge in risk appetite. 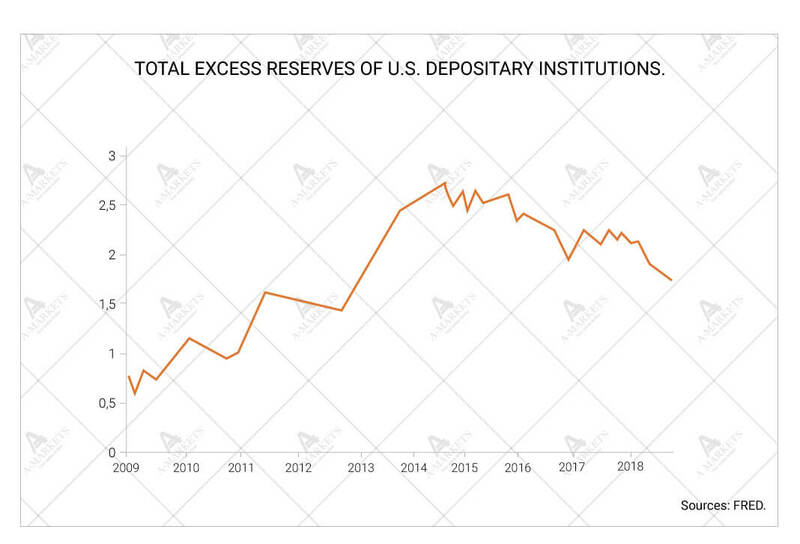 The environment is perfect for these as there is simply no factors for a 2008-like crash: liquidity surplus in the U.S. banking system remains very high at $1.7 trillion (versus the deficit 11 years ago). A fundamental change for the new year is that investors will start reacting to economic data again, and the reaction will be very literal. Positive data coming from the U.S. will reduce risk appetite and vice versa. The major exception is the dollar. The greenback has also demonstrated an extremely asymmetrical response to the newsflow. In 2018, the USD failed to post any significant gains, yet was quick to respond to every negative headline. 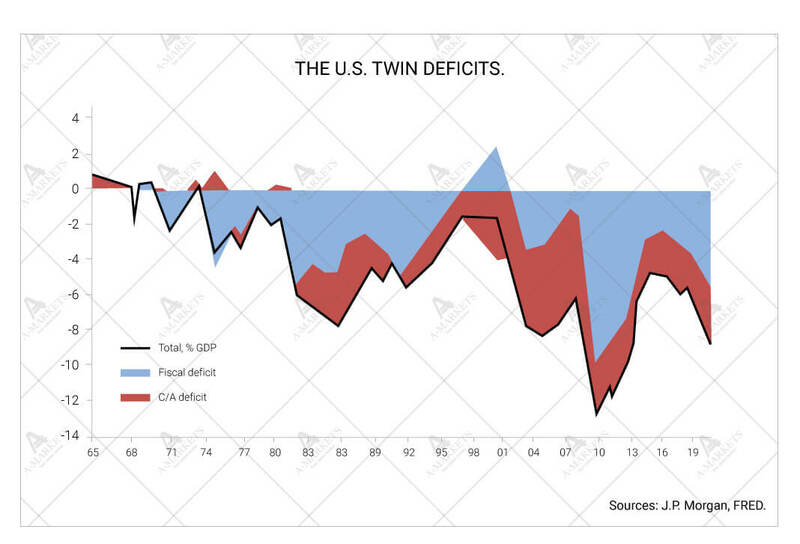 The weakness is likely to drag into 2019 as there is virtually no reason to expect tighter financial conditions from the Fed, while the twin deficits are again an acute problem. But that’s a story for our next review. Among other factors affecting every single market is the PBoC. China’s central bank wants—and needs—to ease its monetary policy, which is virtually impossible amid a trade war. Lower rates or even larger amounts of local liquidity would immediately put the yuan under pressure. 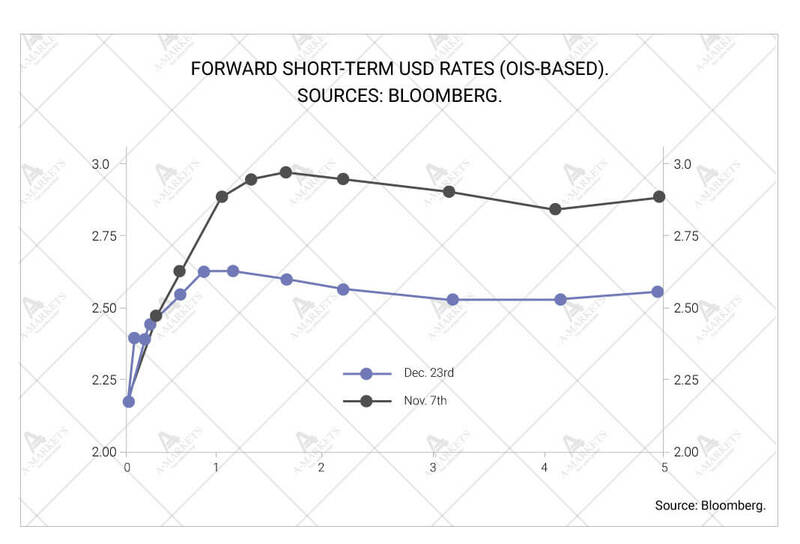 In other words, the PBoC simply can’t ease when the Fed tightens (short-term nominal returns in the U.S. and China are now nearly equal). The trade war difficulties force money out of China, yet Beijing can’t let the yuan weaken now as it would be seen as competitive devaluation by the Trump administration, and risk yet another round of tariffs. That, in turn, would have a negative impact on China’s current account, and exert more pressure on the yuan (of course, we’re simplifying the process for the purposes of clarity). That’s precisely why the PBoC is de-facto tightening its policy. 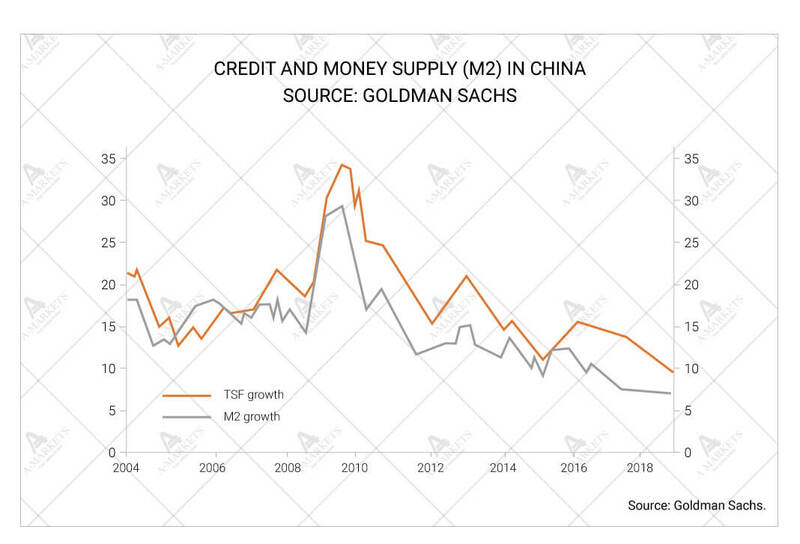 China’s credit is expanding at around about 10%, while M2 money supply growth is at just 7.5-8%. Both values are the lowest since the beginning of the ‘00s. It is critical to understand that the Chinese economy has accumulated sizable imbalances and it’s only a matter of time before the yuan devaluation begins. We estimate that the USDCNY will reach 7.25 in H2 2019 in one of the most important market events. That will likely hit all EM-currencies, and, unless the Fed acts, could trigger another risk-off episode. That said, Beijing can still buy some time in the dispute with the U.S. by loosening the fiscal policy. In fact, the government has already announced new individual income tax cuts. The program amounts to 0.6-1.2% of GDP, a better estimate will be available as more details become public. And the last, but not least, of global market-moving stories is, of course, Brexit. 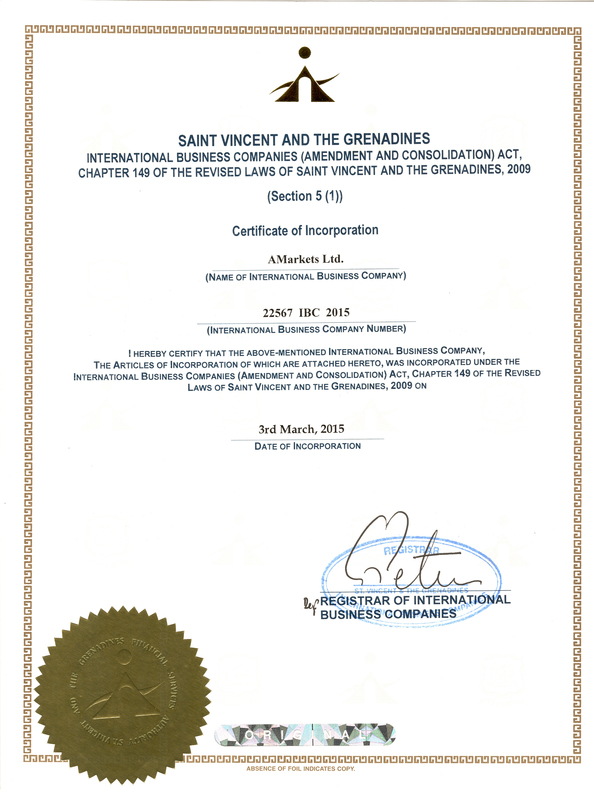 The United Kingdom is to leave the EU on March 29, 2019, yet the deal is still not finalized. The biggest roadblock is the British parliament itself which is reluctant to approve Theresa May’s Brexit plan. 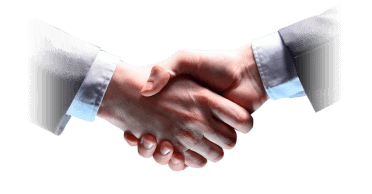 We did read the deal and actually find the contents reasonable, given the circumstances: most of economic freedoms are still there, while the thorniest of the issues are put off till later. Most MPs will surely read the plan by the end of January, taking the number of “yes” votes higher. Of course, it is still too early to bet on a positive outcome. 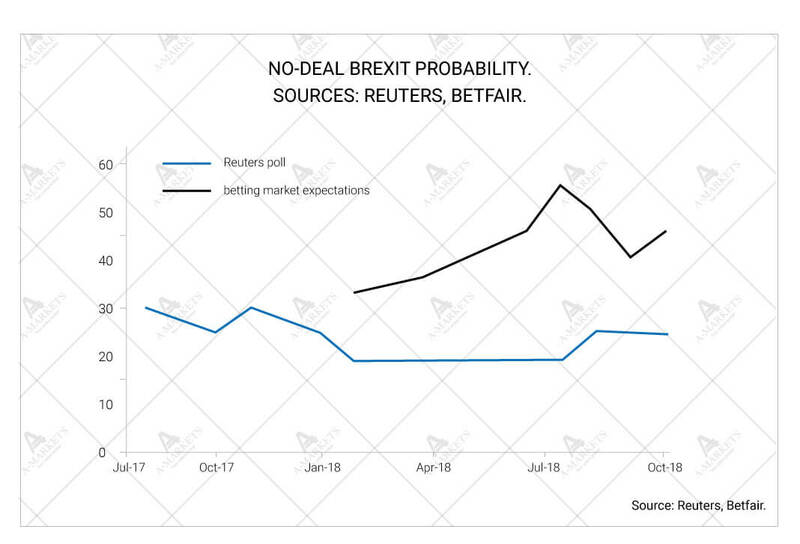 Brexit remains the key risk for the British pound and could grow into a systemic problem should the worst-case scenario suddenly plan out. We, however, note that there are bigger risks to be worried about. The market is aggressively discounting a serious global growth slowdown, yet the Fed and the PBoC—the regulators of the world’s two largest economies—are not providing the market with fresh liquidity anymore. We expect the Fed to shift its rhetoric and tactics in early 2019. But if Mr. Powell decides to be conservative in his policy-making, the positive effect won’t last and the PBoC will ruin the fun as soon as H2 2019. Going short USDRUB at 68.8 targeting 62.1, stop-loss at 72.5. 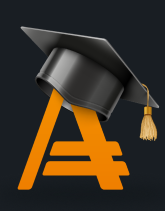 Going short AUDNZD at 1.05, targeting 1.012, stop-loss at 1.062. Going long USDCNY at 6.9 targeting 7.25, stop-loss at 6.85. Alternatively, go short gold (XAUUSD) at 1280, targeting 1044, stop-loss at 1302. Going short EURUSD at 1.18 targeting 1.072, stop-loss at 1.195. Going short CADNOK (a USDCAD long against a USDNOK short) at 6.44 targeting 6.08, stop-loss at 6.56.